Are “Korean style” hot pants causing a rise in dengue fever? This year, 90,000 cases of dengue fever, which is spread by mosquitoes, have been reported in Thailand, and 100 people have died of the disease. In an effort to stem the disease, the Thai government has advised people to wear long pants, as opposed to the hot pants that have become popular in Thailand because of the popularity of K-pop (South Korean pop music) girl groups like Girls’ Generation and Kara. “Teenagers that wear the ‘Korean style’ short pants are more likely to be bitten by mosquitoes,” said the Thai Deputy Minister of Public Health Anutarasak. I was unaware that Koreans invented hot pants. I suppose they invented blue jeans and hoodies, too. Another look at those dangerous garments. “Corn Frosts”? 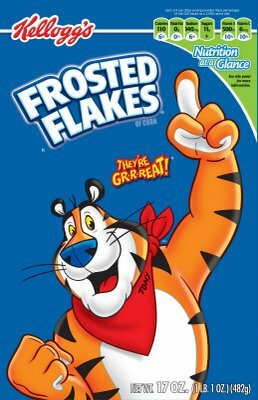 Don’t they mean “Frosted Flakes“? A major newspaper shouldn’t be reprinting Konglish in their headlines, even if said Konglish is commonplace. 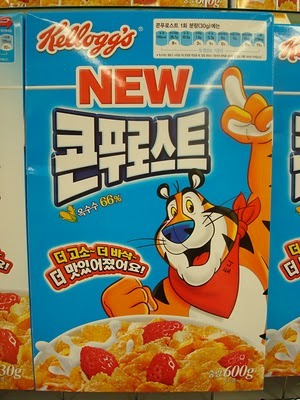 Still, speaking of food safety, the Korea Food and Drug Administration plans to label food as either “red,” “yellow,” or “green.” Based upon the colours of traffic lights, this is intended to tell children which foods are good for their health (green) and which are not (red). “By clearly showing to the children what nutrients the foods they eat contain, the system will help them better manage their eating patterns. It will be used for nutrition education,” Park Hye-kyung, director of the nutrition policy division at the KFDA, told The Korea Herald. According to the plan, a red traffic light label is to be attached to a snack if one serving contains more than 9 grams of fat, 4 grams of saturated fat or 17 grams of sugar. If a meal contains more than 12 grams of fat, 4 grams of saturated fat or 600 miligrams of sodium per serving, it will also get a red label. The KFDA found based on its simulation tests that at least 74 percent of chocolate products, 58 percent of ice cream products and 42 percent of bread would be labeled with a red traffic light under the new plan. It also found that some 76 percent of hamburgers and sandwiches would receive red light labels. 1. Could a public toilet make my buttocks detach themselves from my body and attack me? 2. The Korea Times has another winning article. It turns out that you should be mindful of the fact that some toilet paper has whitening agents that are banned from use in napkins, hand wipes, and diapers because of potential allergic reactions. So watch out your buttocks. There’s a new drug on the market that imitates the effects of marijuana, and is, at least for now, legal in the United States (but –get this– is banned in most of Europe. I’m not sure about Canada, but given that we’re all a bunch of potheads …). The users are buying a product known as K2 — or “Spice,” Genie” and “Zohai” — that is commonly sold in head shops as incense. Produced in China and Korea, the mixture of herbs and spices is sprayed with a synthetic compound chemically similar to THC, the psychoactive ingredient in marijuana. Users roll it up in joints or inhale it from pipes, just like the real thing. “Made in Korea”? Which one? South Korea has strict drug laws (which many expatriate teachers find out the hard way). North Korea has a history of producing and trafficking illegal drugs to try to prop up its basket case of an economy. So, I’m guessing it’s the North. The key ingredients are believed to be the unintended result of scientific research on marijuana’s effects. Dr. John Huffman, a Clemson University organic chemistry professor, was researching the effects of cannabinoids on the brain when his work resulted in a 1995 paper that contained the method and ingredients used to make the compound. That recipe found its way to marijuana users, who replicated Huffman’s work and began spraying it onto dried flowers, herbs and tobacco. “People who use it are idiots,” said Huffman, referring to K2 smokers. There is no data on the drug’s toxicity or how long it stays in the body. In mice, it can lead to a lower body temperature, partial paralysis and the temporary inability to feel pain, according to the DEA. Anyone living in Korea knows that Koreans don’t get enough sleep (either through insomnia or by being forced to work long days). You can see people here dozing off anywhere: on the subway, on the bus, in class, in the office, etc. This is a sure sign of sleep deprivation. A recent study suggest that you cannot recapture lost sleep. That is, even if you “catch up” on sleep lost during the weekdays by sleeping in on the weekends, you will still suffer the ill effects of chronic sleep deprivation. Here is a video on the subject. Last year, South Korea ranked 32nd out of 194 countries in a quality of life index by U.S. magazine International Living. This year, South Korea has slipped ten notches to 42nd place. The magazine gave a total score to each country based on points in nine categories: cost of living, culture and leisure, the economy, environment, freedom, safety and risk, health, infrastructure, and climate. The magazine said it evaluated each country based on the UNESCO annual report, WHO reports, data from the U.S. State Department, and research and survey results from Freedom House. Has H1N1 peaked? Are vaccinations safe? According to this report, H1N1 may have peaked. Nevertheless, it’s estimated that 39% of the general population and 75% of infants and preschoolers are to be vaccinated against H1N1. But are the vaccinations safe? A middle school boy fell unconscious from a cerebral hemorrhage after receiving a vaccination. Last month, an elementary school student died three days after receiving a similar vaccination. Of course, even if there is evidence of causality, it still doesn’t mean that there is cause for alarm, considering how many vaccinations there have been, and weighing these risks against those posed by the influenza itself. In the Korea Herald, Dr. John Clemens, the International Vaccine Institute’s Director General, recommends that everyone get vaccinated. “But to date, there are no worrisome indications that these vaccines cause more side effects than the ordinary flu vaccine, without a doubt, vaccines are the best way for individuals and for societies to brace against the pandemic,” he said. Some have said that labeling this virus a pandemic conjures up visions of death and decay generally portrayed in Hollywood films but Clemens said that it is not the case. “Pandemic is a useful term from a societal perspective,” he said.